Air Costa, which on March 27th obtained DGCA approval to fly its two brand new leased Embraer E190s, deployed an E190 on commercial service from today, to cater to an unforeseen operational issue. One of Air Costa’s two Embraer E170s developed a windshield crack when operating into Bangalore, today, forcing the airplane to stay on ground for a few days till the windshield is replaced. To prevent disruption in operations, one of the E190s will be pulled into commercial service. Air Costa’s E190s seat 112 passengers in a single class, 45 more than their dual-class E170s. 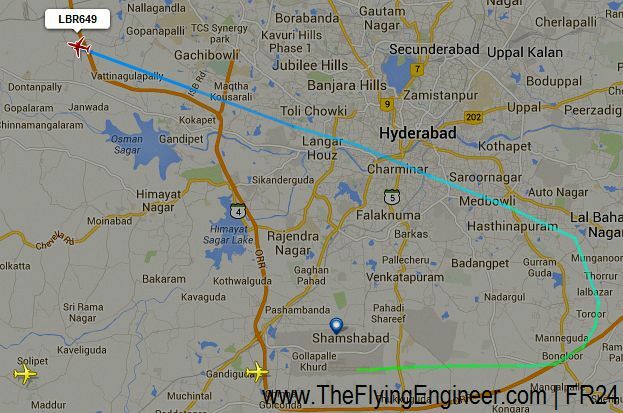 The E190, registered VT-LBR, operated the Air Costa LB649 Hyderabad (ICAO: VOHS, IATA: HYD) – Jaipur (ICAO: VIJP, IATA: JAI) flight, marking the first commercial flight in India involving an Embraer E190. The flight, scheduled to depart at 14:05hrs IST, departed at 15:24hrs IST, picking up a 01:19hr delay due to the unforeseen pull-out of the E190 from parking into line operations, and the pull-out of the E170 from line ops. The E190s were expected to be inducted into commercial service on 5th April, 2014. This bittersweet incident marks another milestone in Indian regional aviation, while also serving to emphasize how at the start-up phase of an airline, when the fleet is small, the non-availability of one aircraft can have significant operational ramifications. Air Costa plans to stand out from the competition with its fares, connectivity, and unmatched cabin seating convenience and comfort.